In regions of poorly cemented surface materials it is possible to create large features due to just the action of the wind. The equatorial region between Olympus Mons and Apollinaris Mons is dominated by wind etched regions. 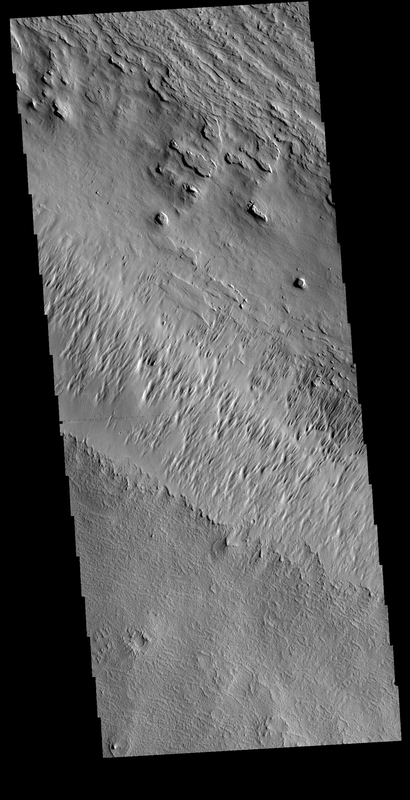 This region east of Apollinaris Mons contains just such a terrain. The direction of the wind aligns with the ridges and valleys. The dominant wind direction in this region is southeast to northwest; however, other wind directions can occur within a localized region.The top of this VIS image follows the regional trend, with a smaller central surface indicating winds perpendicular to the prevailing direction.